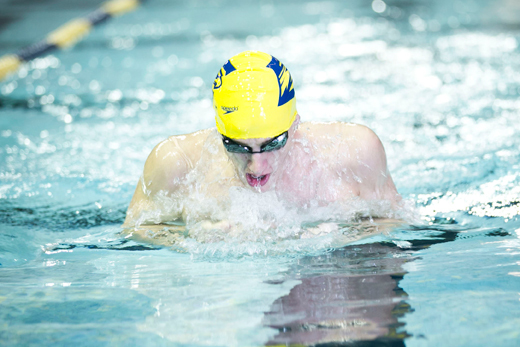 Andrew Wilson, a rising senior majoring in physics and applied mathematics, credits Emory for inspiring him to excel both in the pool and the classroom. “Emory is where I got really serious about swimming,” says Olympic hopeful Andrew Wilson, a rising senior who broke his own record this spring and swam one of the fastest 200-yard breaststroke times in the world. A five-time national champion, Wilson has qualified for the 2016 U.S. Olympic Trials in both the 100-yard and 200-yard breaststroke. The Olympic Trials, set for June 26 through July 3, 2016, in Omaha, Nebraska, will determine who represents Team USA in the 2016 Summer Olympics in Rio de Janeiro, Brazil. This year, Wilson was named the National Collegiate Athletic Association Division III Men’s Swimmer of the Year, after winning three national championships and setting new division records in the 200-yard individual medley, 100-yard breaststroke, and 200-yard breaststroke. His 100-yard breaststroke time was the ninth-fastest ever by an American (short course yards), and his 200-yard breaststroke time ranks him 13th in the world. In 2014, the Emory Eagles swimmer was a two-time NCAA champion as part of the 200- and 400-yard medley relays, NCAA Division III All-American, University Athletic Association Champion and All-AAU Team member. In 2013, Wilson was recognized as an NCAA Division III All-American, UAA Rookie of the Year, UAA Champion and a member of the All-UAA Team. With five national championships and 12 All-America certificates in swimming, Wilson also maintains a commitment to academic excellence. In keeping with Emory’s long tradition of student-athletes, the physics and applied math major was named as a College Swimming Coaches Association of America Team Scholar All-American in 2013 and 2014 – and as a Capital One/CoSIDA Academic All-District Team member in 2014 and 2015. This spring, Wilson received an invitation to participate in Emory’s Math and Computer Science Honors Program, which considers majors with a 3.5 GPA and reaches out to them in their junior year. Unfortunately, he could not accept the invitation due to demands on his time by the upcoming Olympic Trials. Growing up in Bethesda, Maryland, Wilson played baseball, lacrosse and soccer before his high school years when he focused on swimming and water polo. He graduated from Phillips Academy in Massachusetts, where he was a three-year letter winner and helped his team win the New England Championships in 2010, 2011 and 2012. Fall 2012 saw Wilson enroll at the only college to which he had applied. “I like to trust my gut, and Emory just felt right,” he says. He looks back on that decision as pivotal in his life. Attracting exceptional student-athletes, Emory is one of a handful of schools in the nation to rank at the top in both the Directors' Cup of the National Association of Collegiate Directors of Athletics for best all-around athletics program and in the U.S. News & World Report rankings of best national universities. The Emory experience broadened more than his athletics horizons, according to Wilson. “My math professors, like my swimming coaches, opened doors that I did not know existed,” he says, recalling that his coaches consistently stressed the importance of excelling in the classroom as well as in the pool. “I was pretty confident coming to college that I wanted to do engineering. But my professors helped me understand how much I really enjoy math, and they showed me what I can do with math that I did not know was possible,” explains Wilson, who is considering graduate school and perhaps a career in math modeling. Wilson credits his parents, Bruce and Lisa, for encouraging him to do his best throughout the years in sports and studies. He also acknowledges the likely role of genetics in his academic aptitude, math skills and athletic abilities. Both of his parents are lawyers, and his mom was an economics and math major and a member of the gymnastics team at Yale. Competitive spirit and affinity for swimming also seem to run in the family. Wilson’s older sister Jenny, a NCAA Division I swimmer, competed in the 2012 Olympic Trials. Younger sister Julia is a member of the Kenyon College varsity swim team. When Emory and Kenyon competed last spring, the siblings found themselves “discreetly” cheering for each other, as well as their respective teams. Perhaps it comes as no surprise then that Wilson’s advice for others who share a commitment to world-class achievement is simple.